Product prices and availability are accurate as of 2019-04-24 11:00:16 BST and are subject to change. Any price and availability information displayed on http://www.amazon.co.uk/ at the time of purchase will apply to the purchase of this product. 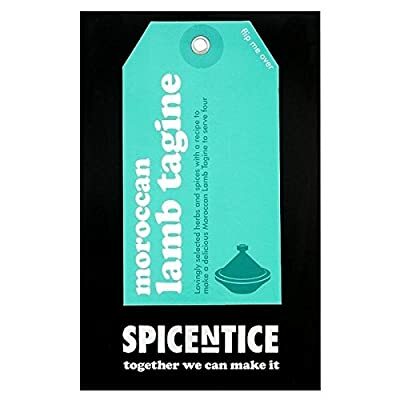 A clever little (no waste) spice kit for cooks of all abilities to make a delicious Moroccan Lamb Tagine to serve four in no time at all. Inside the kit you get 100% pure herbs & spices (guaranteed no additives, preservatives or artificial colourings), which have been lovingly selected then measured in just the right quantities to make a perfect spicy meal. To make the dish, just add a few fresh ingredients from the shopping list below (which is also on the back of the pack) and follow the easy to prepare recipe you'll find inside the kit. Everyone can make it with Spicentice! Spice heat: Medium Prep time: 10 mins Cooking time: 90 mins My shopping list... - 650g Lamb (diced) - 4 Onions (medium) - 2 Potatoes (medium, optional) - 3 Garlic Cloves - 10 Dried Apricots (cut in half) - 400ml Tomatoes (tinned) - 6 tbsp Cooking Oil - 1 tsp Salt - 3 tbsp Toasted Almonds (for garnish - optional) - Handful Fresh Coriander (for garnish - optional) Lovingly selected herbs and spices with a recipe to make a delicious Moroccan Lamb Tagine to serve four. Together we can make it. 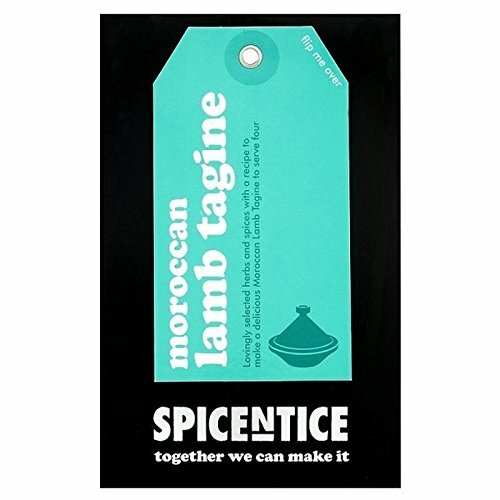 A clever little (no waste) pack of 100% pure herbs & spices, with an easy to prepare recipe that serves four. Everyone can make it with Spicentice - just add a few fresh ingredients and one big pan!